Before we get started, just a reminder that we will be making 2 animated brushes (.gih) and 1 regular brush using the .gih extension. Logically, the 3rd brush is an animated pipe brush, but not really to be used for that purpose. 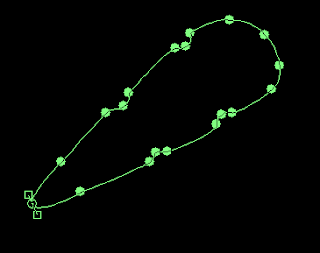 You will not need any special scripts or plug-ins to follow along in this tutorial. 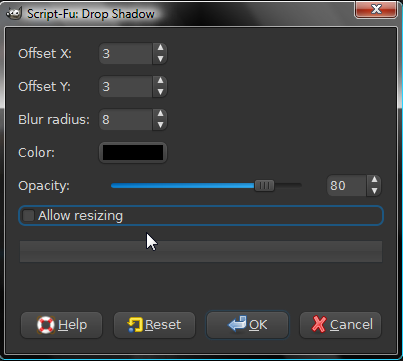 I am currently using GIMP 2.6.7. 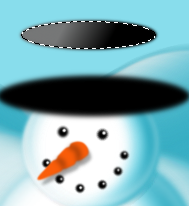 Open a new drawing 200 x 200 at 300 dpi with a transparent background. 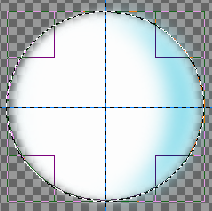 Fill the circle with white using the Bucket Fill tool. 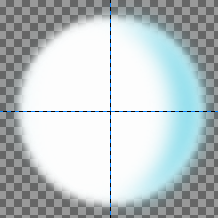 Create a new transparent layer, name it "Light Shade". Do not de-select the circle selection. 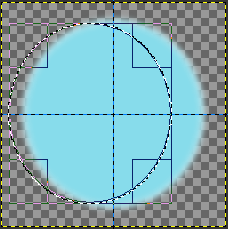 Using the bucket fill tool, selecting the color "88ddec" for foreground, fill the circle in the new layer. 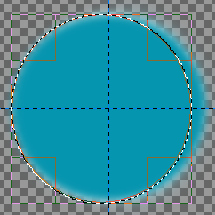 Hit the DELETE button to remove the blue area from the layer. Fill the circle with the darker blue (0796b0). 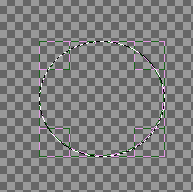 De-select the circle (Selection/None or Shift+Ctrl+A). 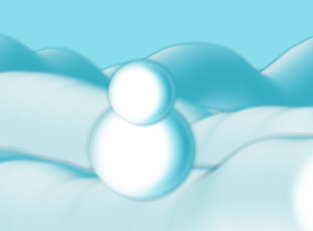 Your "Snowball" is done, but now you need to save it as an animate pipe brush. Your snowball is done. 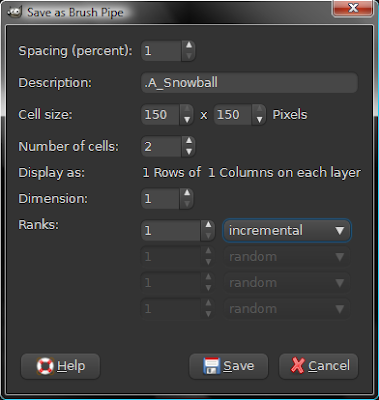 Click save then refresh your brushes dialog. It should now be toward the top of your brush list. 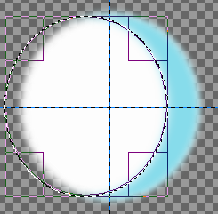 Duplicate the EXACT same Steps 1 through 11 for the second pipe brush, with the only differences being the colors used. For the color white, substitute: light brown "614d28". For the light shade, substitute: "4c3710". For the dark shade, substitute: "362604". Save the file as twig.gih to your brushes folder. 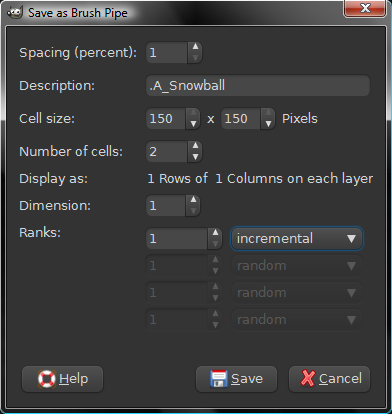 For the description on the pipe brush prompt, name it ".Twig" using the same settings you see in Step 11. 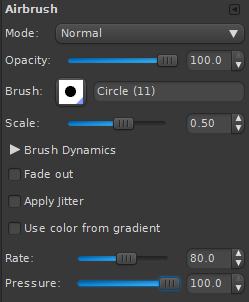 Don't forget to refresh the brush dialog list. 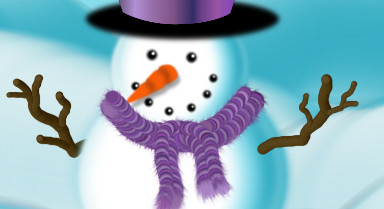 Now you have your snowball and twig brushes that should serve you well in making multiple snowmen, etc. You can go on by opting to make a "coal eye w/glint" brush to save you duplication steps using similar steps, if you feel you need to. 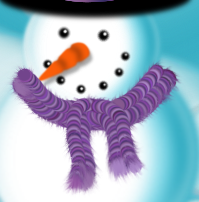 However, my attention is on making my snowmen complete by making a "Carrot Nose" brush. Open a new drawing 150 x 150 px, transparent, at 300 dpi. 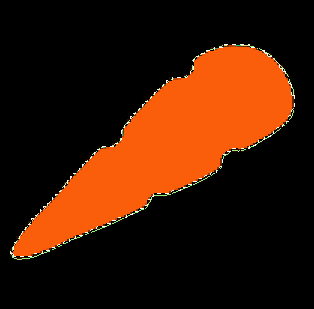 Align the nodes to better represent the grooves in the carrot. My version above was a little bit sloppy. 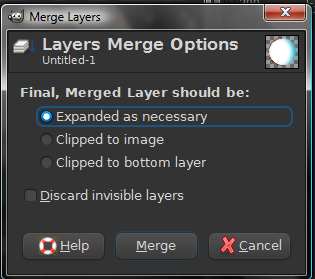 I filled my background with black so that you could see the nodes, if you decide to do the same, make sure you create a new layer and place it at the bottom of the layer dialog. 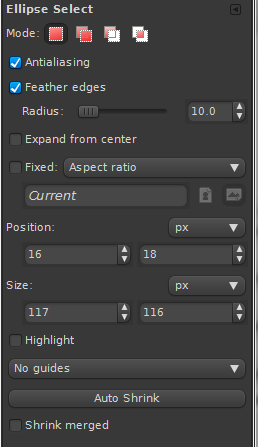 You can turn it off the black background layer (click eye) when you are done. In the Paths Toolbox dialog, select Selection from Path. 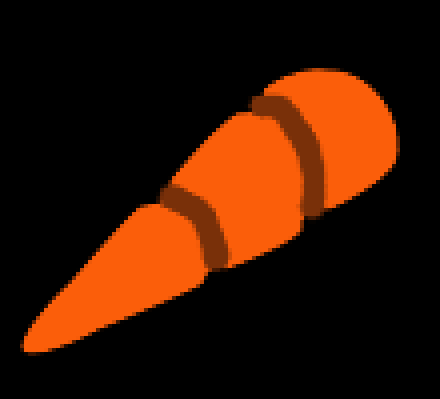 Add a new transparent layer, name it Carrot shade. 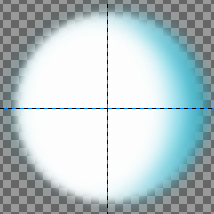 Filters-Blur-Gaussian Blur, set at 15px both vertically and horizontally. RLE method. 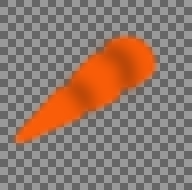 Merge the Carrot Shade layer down once. Delete the black background layer. 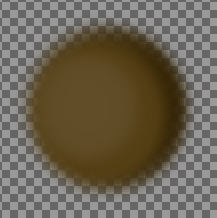 You're done, it's time to save it as a brush (users/.gimp-2.6/brushes folder). Name it carrot.gih. We're not necessarily trying to make it an animated brush, but will be using that process to preserve the transparency/colors of the brush. Don't forget about using "periods" (.) in your descriptions to move the brush toward the top of the list. 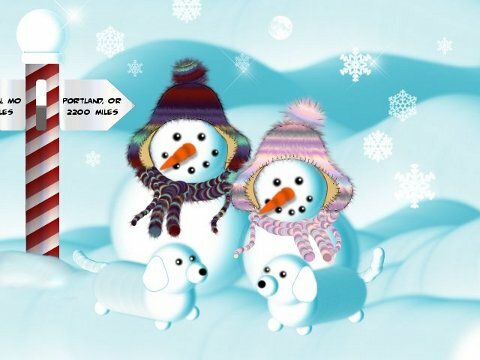 Refresh your brushes dialog and then we are ready to make a snowman, woohoo! 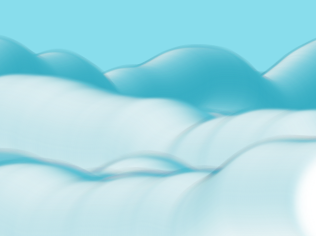 I started with a new drawing 640 x 480 at 3oo dpi, adding a new transparent layer naming it "snow mounds". 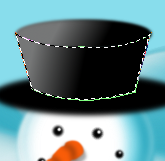 Move the snow mounds layer to the bottom and keep it highlighted. 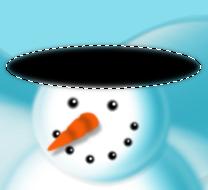 Fill the snow mounds layer with a light blue color. 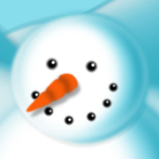 You can enlarge the snowball again to make the snow drift up to the bottom of the snowman, if you want. 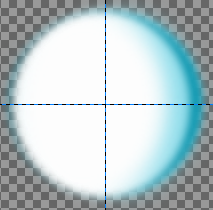 New transparent layer named "nose". It's time for the carrot nose brush, set at about 50 - 60 scale. 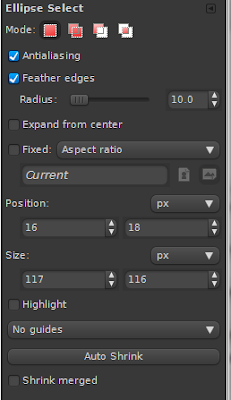 For the left side, make a new transparent layer and name it Twigs Left Side. 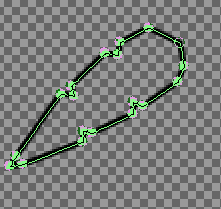 Draw out a twig arm for the left about where it would go, when we are satisfied with its location, we'll move the layer under the snowman body layer. 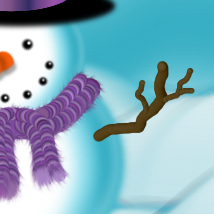 The left side twig layer has been moved under the snowman body, in this image above. 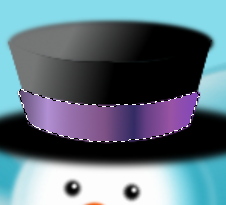 Use the smudge tool like you did with the scarf, using the same settings: 20 scale. And the end result! Add text / font style to suit! The tutorial was longer than I wanted it to be, but the steps are fairly straightforward and easy to do. But like everything else, it needs to be checked for errors and mistakes. If you get confused at a step in the process, don't be concerned about commenting and asking for help. Once you get the animated brushes made, its all downhill, and loads of fun experimenting with. 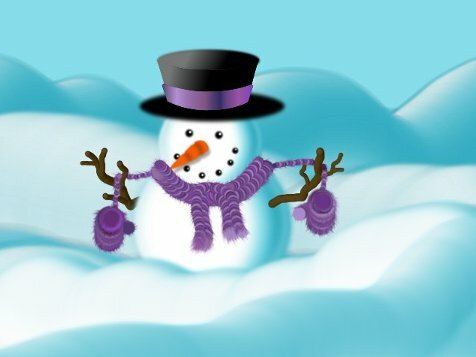 I, absolutely, positively, without a doubt, love the dickens out of this snowman tutorial. Just looking at him brings a smile to my face and thoughts of hot cocoa to my brain and taste buds. 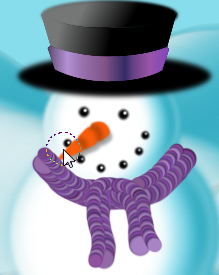 From his festive top hat to his dangling purple mittens, he is perfection! Love him, love him, love him! Good job Mahvelous!!! !